Berkeley Nucleonics introduced a 27 GHz wideband receiver that is a game changer for lab and field applications. Throughout the design process of the RTSA 7500 series Wideband Receivers, Berkeley Nucleonics Corporation’s focus on end-user functionality was paramount. Throughout the design process of the RTSA 7500 series Wideband Receivers, Berkeley Nucleonics Corporation’s focus on end-user functionality was paramount. On a platform that supports Real-Time measurements—with the ability to be daisy chained for multi-channel phase coherence—BNC has shown the world once more that big things come in small packages. With BNC’s Wideband Receivers, a solution is now available for any user with the goal of operating across multiple frequency bands, and without spending large amounts of money on downconverters and time on integration. In order to increase the number of use cases and deployment flexibility, the RTSA7500 series devices only weigh 6 lbs. (2.7 kg), and have footprint smaller than a standard sheet of paper. These features have enabled the perfect solution for both benchtop and field applications. Additionally, rechargeable battery options increase the portability and versatility of BNC’s high performance Wideband Receivers. Becoming a disruptive solution in the highly competitive signal analysis market was no simple task. Nevertheless, the extremely broad frequency range and large instantaneous bandwidth of the RTSA 7500 series have done just that. From 100 kHz to 27 GHz, the Wideband Receivers provide a real-time instantaneous bandwidth up to 100 MHz with 100% probability of intercept (POI) of only 1 µs. With a spurious free dynamic range (SFDR) of 100 dBc, large and small signals are easily captured by these instruments. For applications that require refined control of resolution bandwidth (RBW) and enhanced scanning functionality, the RTSA 7500 Wideband Receivers are capable of a sweep speed of 200 GHz/s at RBWs as fine as 0.62 Hz. “More and more frequently we are seeing the RF/Microwave industry take a conscientious approach towards the balance of form, function, and cost. The RTSA7500 has completely reset the traditional ideas about what that balance means for a real-time spectrum analyzer, by not sacrificing capabilities, portability, user convenience, or even cost of high performance instrumentation.” - Berkeley Nucleonic Corporation’s President, David Brown. The interface for the Wideband Receivers is designed and operated as an easy to use and intuitive GUI. For optimum utility and integration, APIs are available for LabVIEW, MATLAB®, SCPI commands, C/C++, and Python based platforms. With accessibility to these tools, users are empowered to leverage real-time graphs/plots of spectrum, spectrogram, and persistence spectrum—as well as I and Q plots interpreted through a user defined display. By eliminating the large size, fragile parts, and heavy pieces that are no longer required to have a quality product for either lab or field use, Berkeley Nucleonics Corporation offers Wideband Receiver solutions that are incredibly cost effective. As BNC’s real-time spectrum analyzer GUI is provided at no extra charge, the RTSA 7500 series is competitively priced at just under $4k and $6K, with 10MHz and 100 MHz of instantaneous bandwidth, respectively. Berkeley Nucleonics Corporation is a leading manufacturer of precision electronic instrumentation for test, measurement and nuclear research. BNC has its corporate headquarters in San Rafael, California with several additional manufacturing facilities and sales offices located throughout the United States. Founded in 1963, BNC is a recognized leader in the Test and Measurements field. 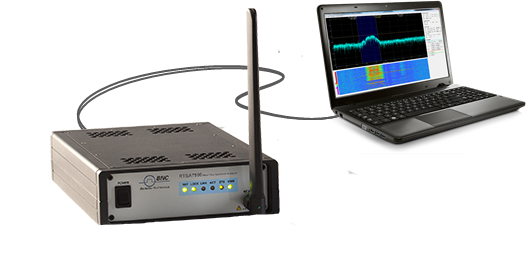 In addition to BNC’s line of Real-Time Spectrum Analyzers, BNC offers a RF / Microwave signal source line of equipment, and Phase Noise Test Systems (Signal Source Analyzers).